Jake: Rico, this is a new student. _____________ name is Sandra Kinsley. Sandra is in _____________ English class. Rico: Nice to meet you. What’s _____________ last name again? A: Excuse me. _____________ you Ms. Brown? B: No, _____________ not. _____________ over there. My name is Nicole Parker. A: Oh, I’m sorry. Well, _____________ nice to meet you. 1. Good-bye. Have a great weekend.  I’m just fine. Thank you.  It’s nice to meet you.  I’m OK. Thank you.  I’m just fine. How are you? 3. Hi. How are you?  Nice to meet you, too.  Hello. How are you, Mr. Smith?  Great. How about you, Mr. Smith?  Good night. See you tomorrow, Mr. Smith. 1. A: What are (it / this / these)? B: (This / They’re / It’s) earrings. 2. A: (Is this / This is / Are these) your sunglasses? B: No, (is / it’s / they’re) not. 3. A: Is (the / this / they) a notebook? B: No, it isn’t. It’s (this / a / an) address book. 1. A: Where are the keys? B: They’re _____________ the briefcase. 2. 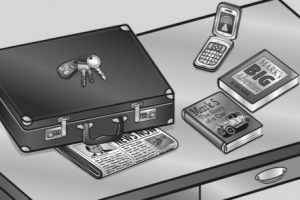 A: Is the cell phone behind the briefcase? B: No, it’s not. It’s _____________ the briefcase. 3. A: Where is the newspaper? B: It’s _____________ the briefcase. 4. A: Are the books _____________ the cell phone?